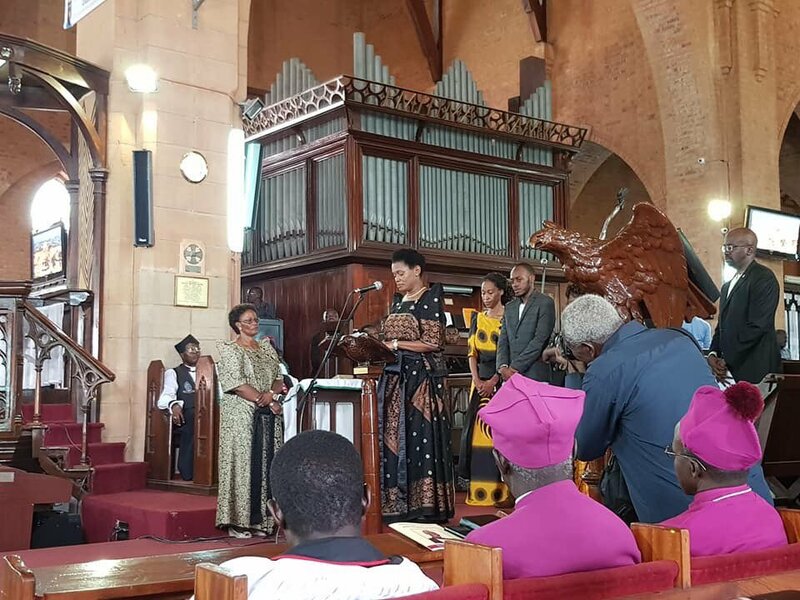 KAMPALA – Thousands of Buganda Kingdom subjects thronged Namirembe Cathedral in Kampala on Monday, April 15 to pay respects to the late father of the Nabagereka. Sylvia Nagginda’s father, John Luswata Ssebugwawo, succumbed to heart and kidney complications at Nakasero Hospital, last week. The funeral service that was led by Bishop Kityo Luwalira was attended by, among others, Kampala Lord Mayor Erias Lukwago, Katikkiro Peter Mayiga, Kyadondo East MP Robert Kyagulanyi aka Bobi Wine, Mityana Municipality MP Francis Zaake, former prime ministers of Buganda Kingdom Dan Muliika, JB Walusimbi and Mulwanyamuli Ssemogerere. The Nabagereka criticized government for neglecting the health sector. She said the problems within the health sector are caused by politics. “We have qualified people, doctors and many of whom want to stay in Uganda. They can do incredible work but they need support. Let us see how to separate politics from health sector,” Nagginda added. The Nabagereka described her father as a loving and caring man. “We are glad despite grief to be with you. Dad loved his children and I specifically remember his usual jovial mood. He focused much on his family and exhibited respect for us all and our mother. He was a good example as a family head,” Nagginda said. Luswata’s widow Edith described her husband as great friend and father. Mr Mayiga said Buganda should be consoled by the great gift of Nabagereka, the late Luswata has left behind. “The 1966 crisis left Buganda bereaved and for the preceeding years after the crisis there was a split in the royal family. Luswata gave us a mother who is innovative, determined is the consolation we have at this point,” Mayiga said. He implored Ugandans to emulate the nature of family upbringing Mr. Luswata exhibited. “The Kabaka wouldn’t have married Nagginda if there was reckless upbringing Its our role to develop the children in the acceptable manner,” Mayiga said. Kampala Archbishop Kizito Lwanga, in a message, asked God to comfort the family. “I am away for official duty but I condole all of you,” he said. Ssebugwawo will be buried today at Nkumba, two kilometres along Kasenyi Road from Abayita Ababiri. He has left behind seven children. Mr. Ssebugwawo studied at Kings College Budo between 1946 and 1955 before joining Kyambogo Technical College where he attained qualification in Electrical Engineering. He later joined Holborn Technical College in Central London, the United Kingdom. Ssebugwaawo retired from Mulago hospital in 1984 and went into farming and business establishing a prominent restaurant, JEB that he operated for 25 years with his wife.